Holcroft Hall, by the side of the Glaze Brook near Culcheth, came into the possession of the Tyldesley family in 1679 through the marriage of Thomas Tyldesley 1657-1714 (the Diarist) to his first wife, Eleanor Holcroft. It was only lost in 1770 when sold after the death of James Tyldesley 1719-1765, grandson of the Diarist. 25 September 1713 —Mr. Parkinson pd all att Leigh ; ffrom thence to Manchestr; spent 1s. with Mr. Hunter and George Woods, and 6d. ffor my sword mending; thence to Houlme. 31 October 1713 —Gave the servantts 4s. ; soe to Wigan ; pd 5s. 6d. ffor a gun stockeing and locking; spent 3s. 6d. on Doctr ffrances Wortington and ye gunsmith (FN3). SEVERAL Messuages and Tenements, being Estates of Inheritance; situate, lying and being in Holcroft, within Culcheth, in the said County, called and known by the several Name or Names of Williamson's, Hopwood's, Johnson's, Greens, and Rowson's Tenements, part of Corles's Tenement, part of Unsworth's Tenement, and part of the Demesne; now in the several Tenures, Possessions, or Occupations of Richard Massey, John Green, Thomas Ratcliffe, Ellen Corles, John Thomasson, and John Crouchley; consisting of 130 Acres of the large Measure (of eight Yards to the Rood) there used, or thereabouts, be the same more or less; which said Messuages and Tenements are well tenanted, adjoin near to each other, and the Buildings are mostly in good Repair.—Also a cottage, and about an Acre and a Rood Land of the same Measure; now in the Possession of Richard Jameson.—Also a Dwelling House, and two small Crofts thereto belonging; now in the Possession of Samuel Hampson. Also the Reversion of a Messuage and Tenement, and about eleven Acres of Land thereto belonging; now in Lease to Giles Winstanley, for three Lives, under a small reserve yearly Rent.—Also the Reversion of a Cottage and Garden; now in Lease to Richard Smith, for three Lives, under a small reserved yearly Rent.—Also the Reversion of a Cottage, and about twenty Perches of Ground; now in Lease to John Unsworth, for three Lives, one whereof is only now in being, under a small reserve yearly Rent. There is a considerable Quantity of Oak Timber fit for Building, and a Number of young Oaks, Ash, Poplar, and other Trees on the Premises. Particulars of the above Estates may be had, by applying to James Tyldesley, Esq; at Holcroft; or Mr Bradley, at Leigh; and any Person may see the Premises, by applying to Henry Calland, of Bury-Lane, within Culcheth aforesaid. 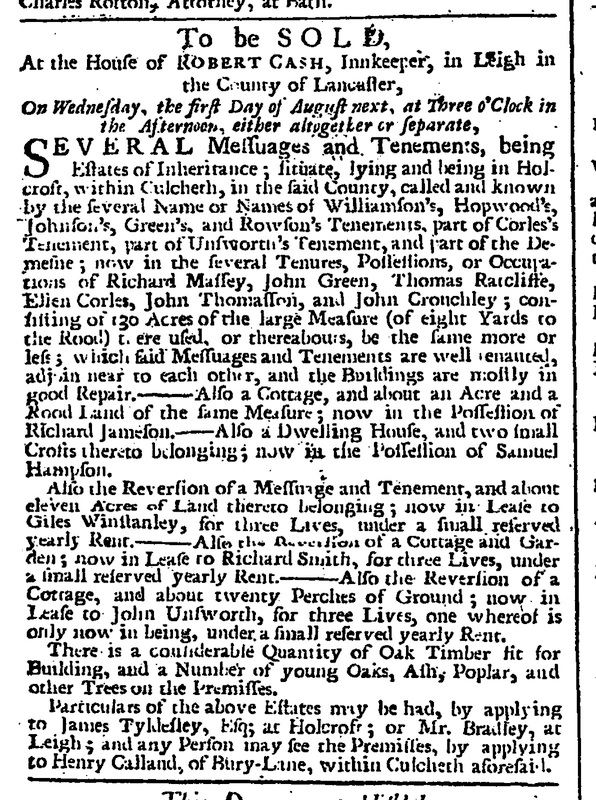 To be peremptorily SOLD, At the House of Mr John Matthias, being the Sign of the Eagle and Child in Warrington in the County of Lancaster, On Thursday the 1st May next at Three o'Clock in the Afternoon, either altogether or in such Lots as shall at that Time be agreed on. 1. Tracts Relating to Military Proceedings in Lancashire during the Great Civil War, George Ormerod (Editor), 1844. 2. The History of the Rebellion in the year 1715, The Revd. Robert Patten, 1745. 4. 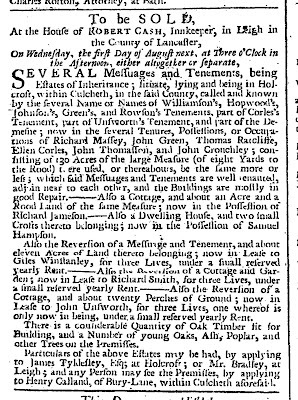 The advertisement is known to have appeared in the London Evening Post of 19 June 1759 and 28 June 1759, and the Whitehall Evening Post or London Intelligencer of 21 June 1759.